The Los Angeles Lakers (29-35) defeat the Orlando Magic (20-45) on a controversial ending that propelled them to a 108-107 victory. This was an ending to a game that had some people upset, and coach Frank Vogel scratching his head. The Magic never felt they were giving a opportunity to get a shot attempt in the final 0.6 seconds because of a inadvertent whistle. Regardless, the Lakers will take the win to make it 6 out of their last 7. The Lakers had a comfortable lead midway through the fourth (99-87) and they seemed to go into cruise control. The Magic went on a 20-7 run in the fourth to take a 107-106 lead with about 5 secounds left. Brook Lopez gets fouled and goes to the free throw line two hit the game winning free throws. He led the Lakers with 27 points and a horrific 0 rebounds in 35 minutes. Kyle Kuzma added 20 points and 10 rebounds. Lonzo Ball had 16 points, 6 rebounds, and 5 assist. 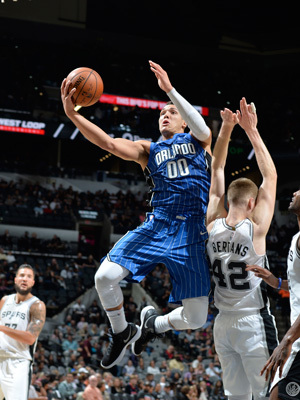 The Magic's Aaron Gordon led all scorers with 28 points to go along with a game high 14 rebounds. Nikola Vucevic added 24 points and 12 rebounds. This was a significant win for the Lakers not just for the fact this keeps them alive in the playoff hunt, but they won the game despite losing the rebound and assist battle.